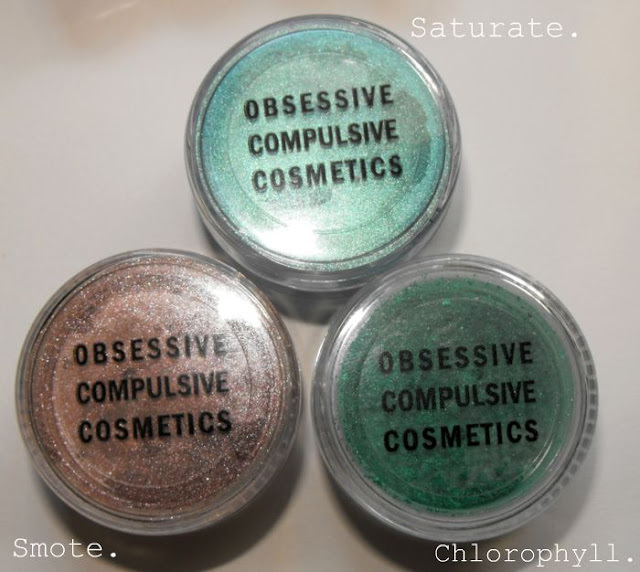 Sophsterlicious • UK Blog: - Obsessive Compulsive Cosmetics: My thoughts. I am here with a very exciting post about some very exciting goodies today! I have been so so desperate to try some goodies from Obsessive Compulsive Cosmetics for ages, and I got a nice package in the post a few months ago, however, they were hit with a big, fat and unreasonable customs charge, which I couldn't afford right away. But I managed to finally pick them up, and as soon as I played with them it was instant true love! I don't know what I expected to be honest, but from the numerous reviews and raves that I had seen over you tube an other blogs, I knew that there had to be something special about them .. and there really is. I have four of the lip tars and three of the eye dusts, and I think that each item is awesome. I had always heard about how little of a lip tar is needed to get maximum pay off, and enough to cover your lips - but I never realised exactly how little is needed, it is unreal! Literally the smallest, tiniest pin prick of a dot of product is enough (maybe too much) to coat your lips! I have never tried anything like it. The pigmentation is amazing, they are smooth and have a subtle hit of mint flavour to them - I am in love with them. The four colours that I have are NSFW, Demure, Cha Cha and Hush. They are all very me and I would wear them on their own, or it is fun to mix them to custom mix your own colours. If you have been curious about lip tars I highly recommend them, I am sooo eager to get more colours now, these could be the only lip product I need in my life! So, onto the eyeshadows, wow, these are as incredible in pigmentation as the lip tars are - Gorgeously bright intense colours that blend like butter and are so eye catching. You get a decent amount of product in the jar, and they can be used either wet or dry, although they look like they are applied wet when they are dry! These get a massive thumbs up from me too - and I need more shades! I am highly impressed with these products, and I cannot wait to get some more, I would love to try the nail polishes too. What have you tried from OCC, any suggestions? You can buy OCC, here. Hush looks so pretty, I want that in my collection...i've been feigning for some lip tars forever!